As we approach year-end many companies are planning for 2017 by reviewing their sustainability strategy and how that relates to corporate social responsibility (CSR) goals. Many times this includes Human Resources working with Marketing to determine the best way to enhance customer acquisition, corporate branding, customer loyalty and employee retention. JustGive’s corporate giving solutions can help you move these initiatives forward. Since 2002, JustGive has been helping companies like American Express, Cisco, DigitasLBi, Hallmark and Pointworthy give back to their communities. Together, we’ve donated over $450 million to tens of thousands of charities. Corporate philanthropy can be achieved through grant making to the community but it can also actively engage customers and motivate employees. Fundraising campaigns—Fall is a great time to encourage a fundraising drive to support food insecurity by matching employee donations to their local food bank bringing charitable giving directly to the communities where your employees work and live. Employee giving—Matching donations speaks volumes for a company’s commitment to social good and directly connects to a company’s CSR goals. Employees are committed to the charities and causes they give to and appreciate when a company matches their donations. It provides job satisfaction, connection to the company and results in higher productivity. Charity gift cards—JustGive’s charity gift cards can be used as a thank you for a referral, a birthday, or the holidays, or an employee reward. Gift cards actively engage customers and employees in the conversation about charitable giving. Branding—An essential hallmark of any corporate program, branding creates awareness and loyalty. JustGive easily brands our microsites to uniquely represent our partner’s logo and message. Charity Choice—Whether you prefer the GuideStar database of charities or a selection of local charities, JustGive believes in charity choice. Our JustGive Guide offers national based charities representing important causes. Or create your own list of organizations important to your employees. Flexibility—Our different types of programs give you the flexibility to decide which type of giving program works best for your social impact goals. We can support multiple programs, each one focused on a different audience. Employees could have a matching program on the company’s intranet while a marketing initiative could demonstrate your CSR efforts to customers with charity gift cards. Reporting—Data is key to communication results and making informed decisions we’ve focused a lot of attention on providing useful reporting within our programs. Corporate partners can connect with their donors, evaluate where the donations are going and learn how to grow the program. We also have accountability reporting so you know when and where the donations were distributed. Contact us to talk about what you’d like to do with your giving program, and we’ll provide you with specific information about cost. Need it fast? Once you’ve signed off on the program, we can be live within 24 hours. To keep up on the latest CSR insights, subscribe to our Blog and follow JustGive on LinkedIn. California-based Patagonia, which specializes in outdoor apparel, has taken an unexpected and untraditional approach to corporate social responsibility (CSR). Sustainability, giving back and caring for the planet are firmly connected in a company conviction that’s clear for customers and the business world to see. That’s supported by Patagonia initiatives to buy and consume less. Yvon wrote in the company’s biography, Let My People Go Surfing, “Patagonia exists to challenge conventional wisdom and present a new style of responsible business.” True to form, in 2012, it was one of the first companies in California to become a Certified B Corporation. Knowing the resources it uses and waste it produces, Patagonia believes it has a responsibility to give back. Rather than thinking of what they do as charity or traditional philanthropy, the company calls it “our Earth Tax,” and considers it part of the cost of doing business. Patagonia is determined to create “the world’s most socially and environmentally responsible supply chain,” and has steered the clothing industry into a more sustainable direction through its actions. With products and suppliers. In 1993, Patagonia was the first outdoor clothing manufacturer to use fleece made from post-consumer recycled (PCR) plastic soda bottles. And in 1996, it switched to using organically grown cotton in all cotton products. It was also one of first major outdoor companies to work with Fair Trade USA on its Fair Trade Certified apparel. In 2007, to be more transparent about its supply chain, the company started publishing the environmental impacts of articles of clothing in The Footprint Chronicles® as well as including it on Patagonia’s product pages. Within the industry. As a founding member of the Sustainable Apparel Coalition—an alliance of 30 companies in the clothing and footwear industries formed in 2010—Patagonia and member companies measure their environmental and social and labor impacts, benchmark performances against each other, and publish the results in a social and environmental performance index. The company’s belief in environmental conservation and corporate responsibility is integrated into its anti-consumption advertising. Maybe the most recognized of these ads ran on Black Friday in 2011 with the surprising message: “Don’t Buy This Jacket”, encouraging consumers not to buy what they didn’t need. Patagonia has echoed this message over the years in its “buy used” marketing with eBay, and most recently, through its Worn Wear initiative about repairing clothes. While many think these messages fly in the face of why the company exists, Patagonia firmly believes it’s just the right thing to do. Patagonia’s commitment to inspire and implement environmental solutions reaches beyond the industry. In 2013, the company launched $20 Million and Change, through a holding company, Patagonia Works. It’s dedicated to a singular cause: using business to help solve the environmental crisis. With this fund, Patagonia helps like-minded, responsible start-up companies which want to work with nature rather than using it up. If you’re inspired by Patagonia to take steps and give back through your company’s CSR efforts, we’re ready to help. Just contact us. For more philanthropy news and CSR insights, subscribe to our Company Blog and follow us on LinkedIn. When I say Campbell’s, the first thing that comes to mind is tomato soup—especially since it’s one of the top 10 foods sold off shelves in U.S. grocery stores today. But you may not know what stands behind the familiar products you enjoy: a business that has integrated social responsibility and sustainability into everything it does. The company was started 146 years ago, in 1869, when Joseph Campbell, a fruit merchant, and Abraham Anderson, an icebox manufacturer, opened their first plant in Camden, New Jersey. Twenty eight years later, Campbell’s created five varieties of condensed soup, including the now-favorite tomato. National distribution of soups followed in 1911. Campbell’s founders pioneered values the company practices today. It is driven and inspired by its purpose: “real food that matters for life’s moments.” The company believes it has a duty to the people who use its products, the communities that support them, and the earth that provides its ingredients. Those values extend to the Campbell’s family of brands, including Pepperidge Farms, V8, Swanson, Pace, Prego, Plum Organics. Campbell’s goal is to cut the environmental footprint of its products in half by 2020. Among other actions, this includes reducing greenhouse gas emissions and water use, and eliminating packaging materials. Since 2008, the company has reduced gas emissions by 17.1% and water consumption by 27.4%. And Campbell’s has eliminated more than 89 million pounds of packaging materials since 2009. For Campbell’s, nourishing consumers means continuing to offer products that promote wellness—with a variety of affordable, convenient and great-tasting foods. In 2014, $2.5 billion of Campbell’s retail sales (about 32%) were foods that satisfied the FDA definition of healthy. Campbell’s is creating a diverse, inclusive and engaging work environment. Its employees, currently 45% women, include the first female CEO and president, Denise Morrison. CSR and sustainability goals are baked into its culture, with company Greatness Awards recognizing employees and teams for results that directly support business strategies and values. Employees around the globe contributed more than 15,000 hours of volunteer service to their local communities. During the company’s annual Make a Difference Week, more than 1,100 employees across the United States tackled 90 community projects. Serving communities is also about philanthropy—giving money, grants and in-kind donations to help them. In 2014, Campbell’s charitable giving totaled more than $70 million, with about $60 million in kind, and another $10 million from corporate donations, cause marketing, nonprofit grants and employee giving. Campbell’s most recent CSR efforts earned the company the #8 spot on the 2015 list of 100 Best Corporate Citizens compiled by Corporate Responsibility Magazine. That’s a move up from #11 in 2014. Campbell’s understands that what they do, every day, matters—and their actions make it clear they take being a good corporate citizen to heart. Borrowing from a popular company marketing campaign, you could say their CSR is M’m, M’m, Good! Inspired to consider improving your CSR efforts and looking for ways to incorporate philanthropy to make a bigger difference? Contact us today—we can help. In our household of three boys, Johnson & Johnson is a familiar brand. But what I didn’t know about the company—which may be best known for Band-Aids®, baby powder and Tylenol®—was that it practiced corporate social responsibility long before the term existed. Caring for the world, one person at a time inspires and unites the people of Johnson & Johnson. In 1943, the company adopted its credo of values that guides decision making and challenges everyone at the company to put the needs and well-being of the people they serve first. Crafted more than 62 years ago by Robert Wood Johnson, the son of the founder, the credo is more than a moral compass . 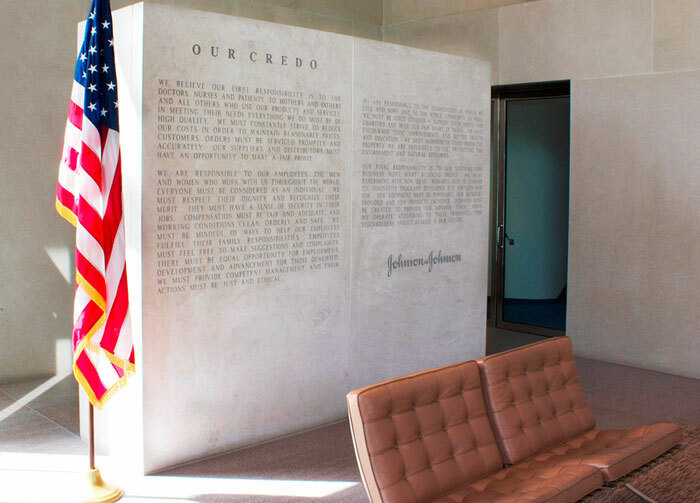 . . it’s “a visionary statement of corporate purpose” and the reason Johnson & Johnson has become the largest and most diversified health care company in the world. Johnson & Johnson’s record of giving goes back to the early 1900s. Within hours of the 1906 San Francisco earthquake, the company gave the largest amount of help received from any organization, establishing its tradition of disaster giving and community philanthropy. Their approach? Work with partners to deliver community-based solutions. One example of a successful partnership is Safe Kids Worldwide. For more than 27 years, Johnson & Johnson has been a part of the global organization dedicated to protecting kids from unintentional injuries. Through a network of more than 500 U.S. coalitions and partnerships with organizations in 25 countries, Safe Kids reduces injuries and deaths from motor vehicles, sports, drowning, falls, burns, poisonings and other activities. By 2008, this campaign had helped reduce the death rate for U.S. children aged 14 and younger by 45%. In 2014, Johnson & Johnson’s philanthropy totaled nearly $172 million for organizations around the world, including $14.5 million through its Matching Gifts program (the company double-matched employee contributions last year). It’s important for the company to evaluate the results of philanthropy, so they’ve set a sustainability goal to increase the number of programs measuring health-related outcomes. 2015 progress: 90 percent of Johnson & Johnson’s 230 philanthropy programs now monitor and report health-related outcomes. Advancing Human Health and Well-Being. In 2014, in response to the Ebola crisis, the company collaborated with the global health community to accelerate and expand production of the Ebola vaccine—to get it to families and health care professionals as quickly as possible. Leading a Dynamic & Growing Business Responsibly. 2015 is the first time Johnson & Johnson has established social goals as part of the company’s overall strategy. 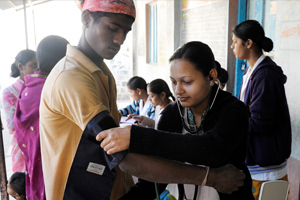 Its Healthy Future 2015 sustainability goals range from environmental sustainability and enhanced supply chain stewardship to greater transparency and commitments to address diseases in the developing world. We’re not all leading global companies like Johnson & Johnson with a 129-year business history and enough resources to tackle world problems. But every business can examine its values and consider how to make a difference with philanthropy. Inspired to get started? Contact us today—we can help. More than 340 Cisco employees donated money and more than 743 hours of time to support the 2014 Global Hunger Relief Campaign in India. When it comes to corporate social responsibility, Cisco Systems, headquartered in California’s Silicon Valley, takes their role in the community and employee giving seriously. Since 2009, Cisco has partnered with JustGive to ensure that the donation dollars and volunteer hour donations from their employees reach the charities they care most about. Cisco has more than 70,000 employees worldwide and powers platforms to help them engage in charitable giving. The company invested in a Salesforce platform that enables Cisco employees to donate to charity and request matching for those donations as well as track their volunteer hours with organizations, which the company also matches. Getting the money to the charities is where JustGive comes in. Using our donation support and processing product, donations made by Cisco employees are received through our Donor Advised Fund (DAF). JustGive then disburses those funds to recipient charities, relieving Cisco of having to create their own nonprofit to process donations. Cisco employees also volunteer in their local communities, dedicating many hours to organizations that address poverty, hunger, veterans’ needs and other causes around the world. For every hour an employee spends on volunteer work, Cisco matches it with a donation to the charity. JustGive is a key component to make sure the donations from volunteer hours reach the specific charities for Cisco employees. “Since we started working with JustGive, we’ve supported over 3,000 U.S.-based schools and charities, and JustGive has helped Cisco employees and the Cisco Foundation provide almost $50M in donations and matching gifts,” said Julie Rose, head of Cisco’s matching gifts program in the United States. Cisco also uses our GiveNow Charity Gift Cards for employee service rewards in the U.S. and Canada. Employees receive a gift card ranging from $50 to $500 as thanks for their years of service to the company. They redeem their gift card on a Cisco-branded website—powered by JustGive—to donate to any charity or school approved for the program. “Feedback has been great from employees who are able to select a JustGive charity gift card. They appreciate the option to donate to charity instead of receiving a gift for themselves,” said Racquel Stotomas, a Human Resources Manager at Cisco that runs the employee service awards program. So the next time you see the Cisco logo, know that the people behind those products are also making a difference with charitable giving around the world. We’re proud to partner with Cisco to help deliver effective and engaging CSR programs so that employees, with the company’s support, can pay it forward in a variety of ways. 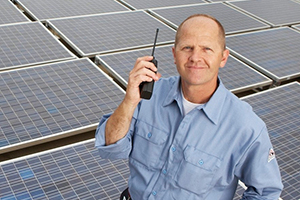 Inspired to improve your CSR efforts? We can help you include philanthropy that supports your goals — just contact us. Don’t miss the latest CSR and philanthropy news and insights: Subscribe to our blog, and follow us on LinkedIn. Despite your first thoughts: For The Walt Disney Company, it’s not all about having fun, and creating memories for families and kids. It’s also about acting responsibly, and corporate social responsibility is an integral part of their brand. “Our efforts to be a good corporate citizen have a direct impact on our financial strength, as well as our reputation as one of the most trusted and admired companies in the world,” commented Chief Financial Officer Jay Rasulo in the 2014 Disney Citizenship Performance Report. To Disney, citizenship also means motivating others. The company believes that the example set by its more than 180,000 employees is nothing compared to the impact it can have when it inspires the millions of kids and families it reaches every day to take action and make a difference. 1. Act and create in an ethical manner and consider the consequences of decisions on people and the planet. This includes not just ethical conduct, but also responsible content, environmental stewardship, respectful workplaces and a responsible supply chain. One recent accomplishment: In 2012, Disney launched Heroes Work Here with an initial goal to hire more than 1,000 veterans by 2015, and then made a commitment to hire an additional 1,000 veterans. As of October 31, 2014, the company had hired more than 3,800 veterans in 31 months. 2. Champion the happiness and well-being of kids, parents and families – Help make healthier living fun and accessible, and strengthen communities around the world through strategic philanthropy. In 2014, Disney gave nearly $87 million in cash donations to nonprofit organizations and schools. It continued its more than 50 years of support for the Boys & Girls Clubs of America, adding a new sponsorship for the National Youth of the Year program, and investing in the club’s Great Futures campaign so it can serve more members, more often. Donating 18 million books to organizations for children in need and encouraging story telling was their goal. By the end of 2014, Disney had donated more than 23 million books in two years. 3. Inspire kids and families to make a lasting, positive change in the world. This involves nurturing creative thinking skills for kids as well as connecting them to nature to build lifelong conservation values. In 2014, Disney inspired kids and families to take 3.7 million actions, ranging from pledging online to protect the planet and volunteer in local communities, to supporting programs raising thousands of dollars, to unlocking donations to deserving nonprofits around the globe. 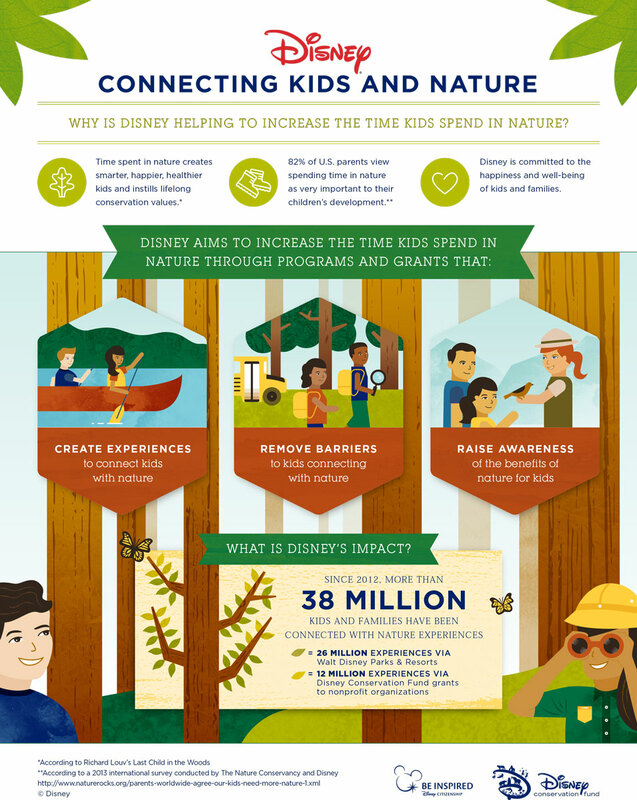 Disney exceeded its goal to connect 35 million kids and families with nature experiences by 2015. About 26 million of these experiences were through its theme parks and resorts, and the other 12 million came from grants to organizations which get kids and families involved with nature. In two years, Disney connected more than 38 million kids and families with nature. In 2012, Disney published measurable targets to track its citizenship performance. The company offers detailed reporting on its progress regularly and in its annual Citizenship Performance Summary. Consistently ranked near the top of the annual list of the World’s Most Reputable Companies, Disney earned the #1 spot last year (sharing top honors with Google). The 2014 list, published by Reputation Institute, a leading reputation management consulting firm, evaluated 130 companies through an online survey with more than 55,000 consumers across 15 markets around the globe. The Walt Disney Company may be an international and large family entertainment and media enterprise with five business segments (media networks, parks and resorts, studio entertainment, consumer products and interactive media), but their commitment and approach set a great example and give any company ideas it can use. Disney clearly understands how to be a good citizen, and takes pride in doing it right! Read more details in their annual performance summaries, which are great resources for setting CSR goals. Inspired to improve your citizenship efforts? We can help you include philanthropy that supports your goals—just contact us. Don’t miss the latest CSR and philanthropy news and insights: Subscribe to our blog, and follow us on Linked In.